We are more than what we remember; we are all that we have made. — Inara Verzemnieks, reporter, writing about the handmade books by artist Shu-Ju Wang. Shu-Ju Wang, a Portland, Oregon painter and printmaker spent the last year working with four senior citizen women in various stages of memory loss. 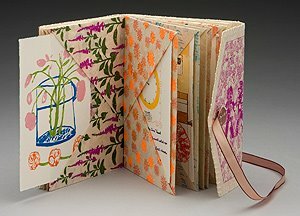 Together, through conversation, painting, printmaking and collage, they chronicled their lives through artful, evocative artist books. Get the full story here. Learn more about Shu-Ju Wang here.